This wooden, heart-shaped box features a swiveling lid. 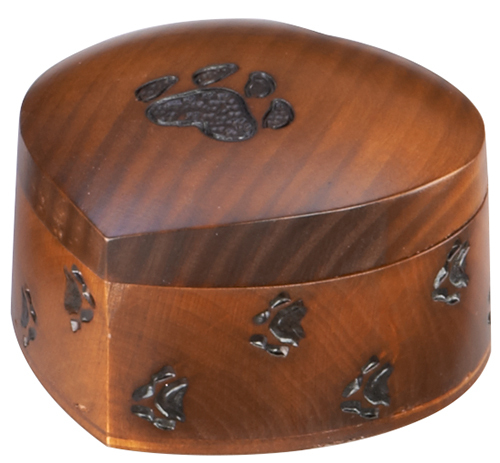 Burned into sides of the box are a series of paw prints, and the lid is adorned with a single print signifying the paw prints that they leave on our hearts. Handmade in the Tatra Mountain region of Poland. Comes in two sizes. This is the smaller of the two and is suitable for both cats and smaller dogs. Dimensions: 4-3/4 in. x 4-3/4 in. x 2-1/4 in.